Utter disappointment. That’s the only way I can describe the way I feel right now. I never enjoy when the Leafs officially get eliminated, but I’ve learned to get used to it. In my short lifetime, the Leafs have only made the playoffs 7 times, but I’ve been fully aware of what was going on for only 4, maybe 5 playoffs. Besides last year, the last time the Leafs made the playoffs I was in first grade. That is really sad. What’s even sadder is the fact that my dad has been waiting for the Cup to return to his hometown since he was 5 years old and it hasn’t yet. Anyway, the Leafs lose 2-0 to Tampa, Columbus and Detroit win, and that’s the season. I don’t want to talk about the game at all because it was brutal and really just the same Leafs team we’ve seen all year, minus the first line scoring. 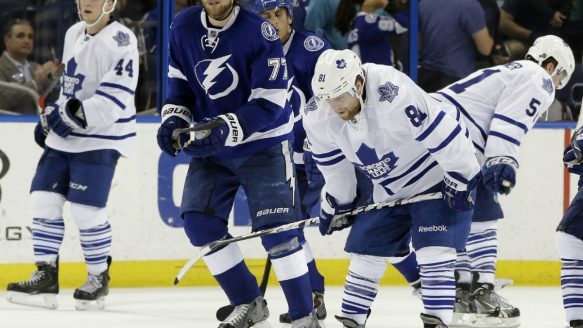 There are still two games left against Florida and Ottawa, and I still have some expectations for the Leafs. 1. They need to continue to play James Reimer in order for his trade value to go up. 2. They have to shut down the first line. Kessel, Bozak, and JVR have to sit because they have clearly been playing injured since at least Sochi. Maybe not Bozak but definitely Kessel and JVR. 3. Bring up some of the star Marlies. They Marlies have already clinched the North Division, bring up Brennan, Smith, Abbott, Leivo, even Carrick, and have them play a few big league games. It couldn’t hurt to see what they’ve got in store for the future at an NHL level. 4. Play hard, make Reimer look great, but please lose both games. Once eliminated, all you want to do is sink lower in the standings so you have a chance at a higher draft pick. It shouldn’t be hard either, after all, the Leafs seem to be great at losing. Carlyle has got to go, along with his coaching staff. The only people that should stay are Rick St. Croix, the goalie coach, and Adam Jancelewicz, the video coordinator. I don’t know enough about the video coordinator to fire him, but the Head and Assistant Coaches have got to go. Claude Loiselle has got to go as well. I think Dave Nonis has done a fine job and should not be moved, however I feel that Carlyle controls the team similar to the way John Tortorella coaches. Carlyle picks favorites, and ripped apart a playoff team from last season. Grabovski and MacArthur both had major feuds with Carlyle, and were bought out and signed because of Caryle. MacArthur also had a great season with Ottawa, and Grabovski is now on Ovechkin’s line in Washington. This was sort of a rant without a lot of support, but I’m just so upset and disappointed that the Leafs let this one slip away. Get your clubs, it’s time to golf! #GolfLeafsGolf! Oh, and I almost forgot, I didn’t write anything about the Boston or Winnipeg games because I couldn’t watch the full games. Sorry about that, hoped you enjoyed this post, kinda, if you’re a Habs Fan for some reason. I'm a young sportswriter covering the Toronto Maple Leafs of the NHL.